Increasing traffic on Twitter means more followers and more eye on your contents. And this is how you do it. As it happens with any social network profile - or digital presence in general - the first step toward getting something useful out of it is having people see it, comment on it, read it and engage with it. While the secrets behind a viral and highly visited account are sometimes still a bit of a mystery, in this post we will show you 5 straightforward and down to earth things you can do right away to increase the chances your Twitter profile will become more visited by other users worldwide, bringing you more followers and a larger audience for your contents. And remember, Twitter is a quality + quantity game so try to find the right balance between good content and a system for producing it and sharing it constantly - you will never hear us saying that it doesn’t matter what you tweet as long as you do it continuously, but if there is one platform where the sheer amount of stuff posted could be a positive signal, this is Twitter. The “follow” mechanism on Twitter can be extremely powerful in increasing the reach and popularity of your account. Let’s admit it, everybody gets a bit of a kick when they see that they’ve got a new follower and so it’s extremely important to leverage that small dopamine rush to get in the radars of the “right” people - that is, the ones most aligned with our target audience and the ones that most likely will enjoy, appreciate and possibly retweet our contents. Tying it with the point above, generally a user we follow checks our account to see who we are and so if they notice a nice stream of interesting articles they are definitely more inclined to either follow back or, at least, retweet some of our contents. Hashtags are one of the most common ways Twitter users discover popular trends to talk about. 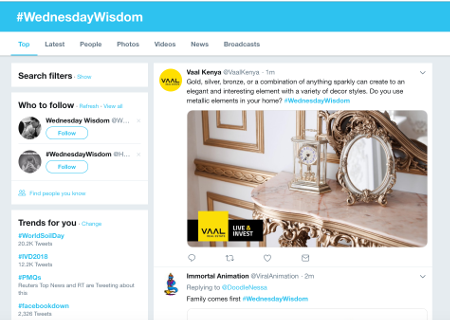 It is therefore extremely useful to keep and eye on the most interesting hashtags for our target audience, regularly chiming in with useful contents about that specific topic and dropping (tweet-sized) value bombs. That’s definitely the best way to quickly rise to the top of crowd - quite literally as it’s one of the fastest route to being featured in the “top” tabs when searching for stuff on Twitter and therefore being automatically presented to a huge crowd of users, organically. Let’s be honest: influencers are the gatekeepers that hold the keys to organic, viral and exponential growth in traffic and visitors. These people have developed the right personality and have put a huge amount of effort into building communities that trust them, listen to them and follow their advice - so it’s no wonder that if you can be retweeted or featured by one of these guys, your message could be greatly amplified and reach a huge audience with (apparently) little effort. Your goal is therefore to engage with influencers by constantly showing you like them (sincere flattery always goes a long way) and providing them with valuable advice or contents to share - in one word, thinking about what they need from you, giving it to them “for free” and trying to convince them you have something useful for their communities. It’s a slow and sometimes painful game, but it’s definitely worth in the end as you build loyal bonds that will always be useful and rewarding in the future. Finally, if there’s one platform where automation is welcome and actually somehow encouraged, that’s Twitter. Obviously you need to carefully choose the right tools as getting banned is a matter of seconds, but if you choose the most appropriate apps that can help you engage better with your target audience or with influencers, you can easily multiply the results you get while reducing the amount of time and energies spent. An example of such a tool is our Tweet Ninja: we created this platform thinking that retweeting the right stuff at the right moment from the right people is essential to get noticed but, at the same time, very time consuming - and so here it is, an A.I.-based system that sift through tons of tweets from your target audience, picks the ones worth retweeting or liking and presents them to you for approval, taking away all the heavy and boring stuff and letting you focus on the strategic and more rewarding activities. If you want to try it, just do it for free now - you’ll never go back to manage your Twitter accounts manually.